This past summer marked two years as a one car family. Our little experiment that I thought would last a few months has become a lifestyle that I can’t imagine departing from. Trimming the fat from three vehicles to one big pick up truck has totally changed my life to a much more active and interactive one. I always wanted this lifestyle but until the choice was taken away from me, like most people, I always followed the path of least resistance. If we had two cars waiting outside I would hit the snooze button a couple more times when my alarm goes off at 5:21am. Cycling to my client’s house in Brentwood takes 34-36 minutes depending on my luck with stoplights and getting the lead out of my tired bones. To arrive by 7am, the latest I can leave is 6:26am. If I had a car my laziness would win every time. I know this because before we became a one car family – for the last, at least five years I’ve been saying “I should really bike to work. Wouldn’t that be invigorating?” How many times did I do it? One time. In five years. Now I have no choice. I can’t leave Alan with two kids and no car all day just because I want to sleep 24 more minutes. Our rule is whoever has the kids gets the car. It IS as invigorating as I thought! My whole life has changed since we went down to one car two Julys ago. It’s like I discovered the secret. The secret to energy, weight management and joy. I know I’m not the first person to ride a bike to work but it is amazing. The sun rising, the early morning air, my heart pumping. I’m exercising and getting where I need to go. Different from going to the gym before work which probably is invigorating too but I don’t have time for that. This is a two for one special! I need to get more bang for my buck and kill two birds with one stone! 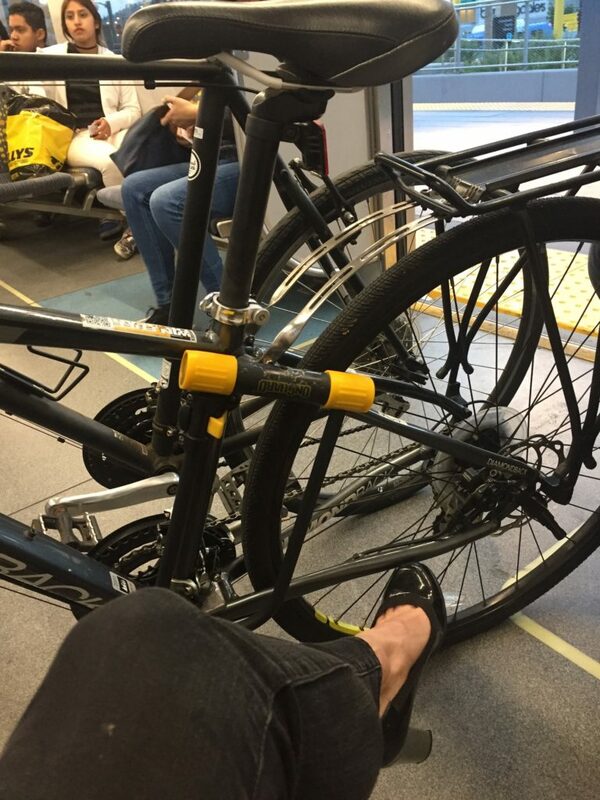 On the metro with my bike! Beyond biking, when I go anywhere now without the kids I take public transportation or Lyft. I feel like I discovered this hidden world in Los Angeles that gives me energy and let’s me see the city in a new, hands on way. It’s what I miss about living in New York and Paris. 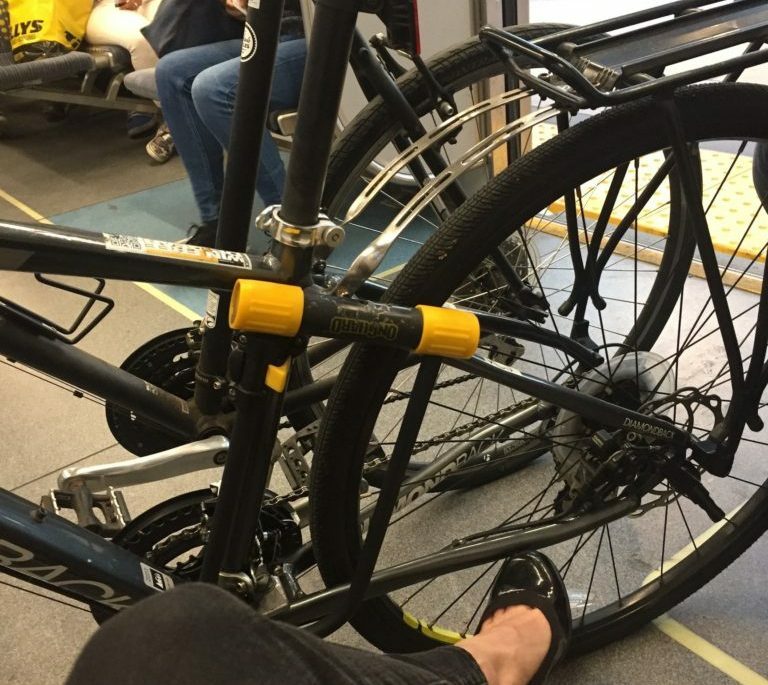 The energy of being out in the elements, among the people – on the bus, metro, on foot, bike, and Lyft Line. I know this sounds silly if you live in a city like New York or Paris but Los Angeles is a car town. You’re really closed off from the world and other people in your protective cell. 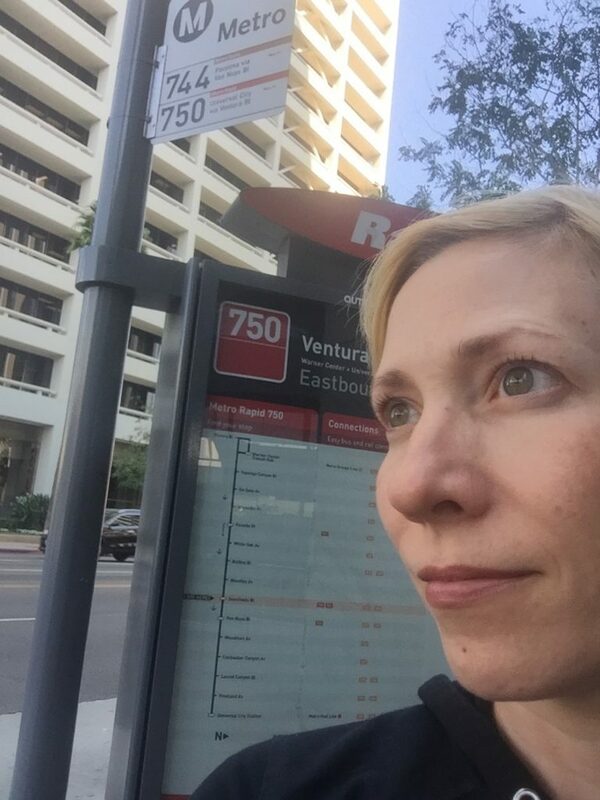 Waiting for the bus on Ventura Blvd. People think you’re down on your luck if you take public transportation in L.A. Oh people here, they LOVE their cars! My mom thinks I’m super weird and can’t understand my choices when it comes to transportation. She implores me to buy another car. “You’ve got to stop this, Molly! I’ll help you pay for another car!” It’s not about finances. 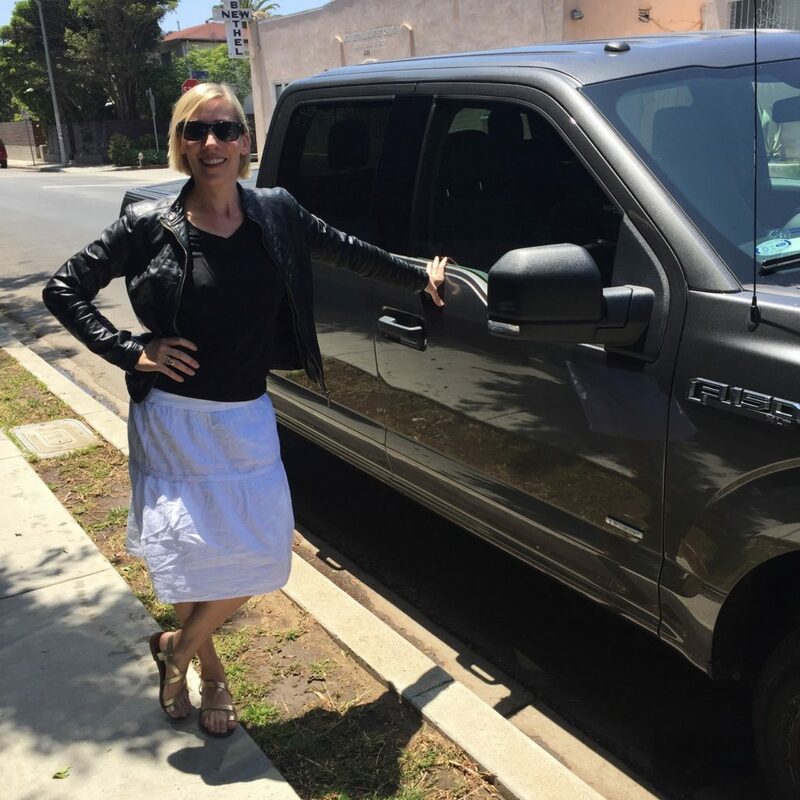 We could’ve bought two nice, used cars for the price of our shiny new truck. I love having one car. It makes me feel alive and part of my community. It has energized my life in ways I didn’t expect. I talk to more people, see things I never would see or notice otherwise. When you’re on foot you move a whole lot slower. You’ll notice a mural or overhear a funny conversation or get to pet a dog. This was an experiment that I wanted to try for a year. It’s been over two and I have no desire to go back to two cars. My work situation has changed in the last month. I’m still ironing out the details of my new Pilates studio and in the meantime I’ve been teaching at Westwood Pilates, (which is an awesome studio!) It’s just a little too far to bike to. I know it’s a temporary situation but I’m getting a taste of how the other half lives – commuters. It blows. I drive about 30 minutes to get there. 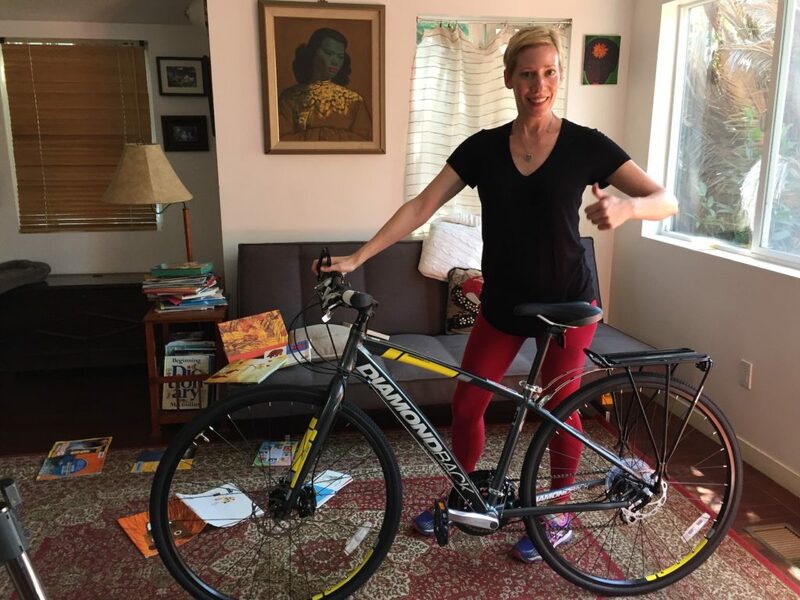 I’ve also quit biking to clients’ houses because I usually have to get to Westwood twenty minutes after. My body really misses that hour or so of pure cardio four days a week. Big time! That lack of exercise has shown up in my body and my overall energy level. This hiccup in my work schedule has further cemented my lifestyle choice. As my kids get older with more complicated after school activities this one car thing may have to change but I’m going to ride it out as long as I can. 1.Once a week walk to your local grocery store. I’m lucky in Venice I have Whole Foods, Ralph’s and Erewhon within a half mile of my house. Still laziness will always prevail unless you set this attainable goal. Walk and carry your groceries when it’s a two to three bag shopping trip. 2. If you have a dog, walk her! Either before work or after. You’ll get to know your neighbors better and feel a part of your community. 3. Get a bicycle! Maybe your job is too far and you can’t arrive sweaty. I do realize I’m lucky in my location and occupation but start slow just on the weekends. 4) Walk your kids to school! I know a lot of people who live within a mile of their kids’ school but drive anyway. I get it, we’re all busy, busy, busy and it’s easier, but what if you fit in an extra 2-4 miles a day of exercise? It adds up in a big way in your fitness level and your waistline! 5) Okay, okay, what if you live too far from work and you can’t be sweaty and you don’t have kids or a dog? Commit to car-free weekends. Ditch your car. Leave it in the driveway and commit to walking, biking, hiking, getting on the bus or metro to transport yourself. It’s fun and you’ll have a story to tell!